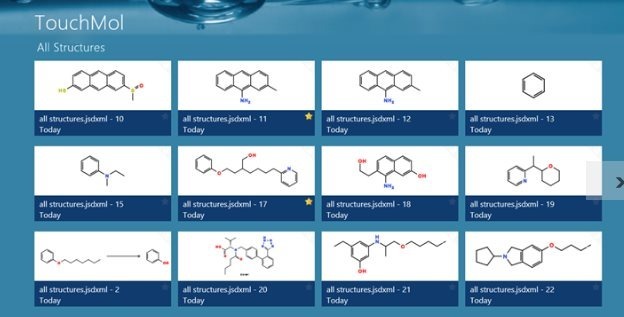 TouchMol is a free chemical reactions App for Windows 8 users to create, search, share biological and chemical structures, at zero cost. This TouchMol Windows 8 app brings you tools to edit a chemical structure or create your own chemical reactions. Create, search, and share the Biological and chemical structures. Offers several tools like templates, ink, charge and the like. Enables you to edit structure by using given tools. Enables you to import and export your files. Offers detail view about the structure. Windows 8 TouchMol App consists of several tools like Templates, Reaction, Ink, Undo and Redo, Charge, Center and many more. In the tools menu, you will find each and every tool required to create a chemical reaction. Just click the right mouse button on the chemical structure in order to get the tools appeared. With a click on the main interface, various options will display as — select all, sort , find, import, and add. By selecting a single structure, you will get options like Favorite, Query, Import , Export, Clear, Edit, and Delete. You can mark a star on the best structure with Favorite option. You can check your structure once again with Query option. The “Export Option” lets you send files to your desktop, documents, and the like. Also, check out our post on Cocktail app for Windows 8. TouchMol App is a good utility Windows 8 app for those who love to work on Chemical and biological structures. Go ahead and try this chemical reaction app for Windows 8.